Recent developments in e-mail marketing are creating new possibilities for an old set of catalog metrics: recency, frequency and monetary value. Here’s the twist. RFM has long been used in cataloging to identify likely nonresponders in a list and suppress mail to them. When applied to e-mail, though, it can help you spot possible spam complainers and eliminate them before they cause Internet service providers to block your messages. RFM is used in print direct marketing solely to measure purchasing behavior. In the case of e-mail, the key variables are the recency and frequency of clickthroughs. Imagine being able to track how recently people opened a catalog and flipped through it — even though they didn’t buy — and then being able to act on that. Moreover, valuable insights can be gleaned by measuring mailing frequency against spam complaints. One reason people press the “this is spam” button is that the marketer has hit them with too many e-mails in too short a period of time, says Deirdre Baird, chief executive of deliverability for e-mail delivery firm Pivotal Veracity. As a result, recency of clickthrough is a valuable measure of how engaged certain segments of a marketer’s e-mail file are. People who have clicked recently are more likely to be responsive than those who haven’t. Conversely, somebody who hasn’t clicked in a long time — the definition of “long time” being different from marketer to markete — is a prime candidate for removal from the e-mail file. A little background: When e-mail first emerged as a marketing channel in the mid to late ’90s, it would have been pointless to apply anything like RFM analysis to it. After all, e-mail costs so little to develop and send. Since then, spam complaints have emerged as the number-one factor used by the major Internet service providers when determining whether or not to filter incoming e-mail. Complainers often tend to be very new or very old to a mailer’s file. They also can be people who signed up for a program, but believe they’re getting too much e-mail. They complain to the ISPs instead of the mailer because it’s one way to stop the onslaught. ISPs are generally pretty secretive about their spam-fighting policies, but conventional wisdom has it that mailers who have complaint rates of 1% or higher run an extreme risk of having serious delivery problems at major providers like AOL. “Think about it: If as little as 1% of your customers complain, you may be prevented from communicating with the other 99%,” says Baird. Some mailers have become more reluctant to experiment with their e-mail, notes Jay Schwedelson, corporate vice president at list firm Worldata. “E-mail is not necessarily the laboratory that everybody seems to think it is,” he says. “You can’t just keep playing around with wild testing because there are repercussions. And once you lose that, you will certainly experience delivery troubles. The spam-complaint rate is one of three primary things ISPs use to determine a marketer’s rep. The other two are how are many inactive addresses and spam traps they hit. Another reason to avoid e-mailing to addresses that have shown no open or clickthrough activity for a long time is that the ISPs turn dead addresses into spam traps, resulting in further troubles. And unfortunately, they can help make it so no one else can do business with you, for ISPs are under no obligation to deliver anyone’s messages. Yes, you can get a block temporarily lifted. But the ISP will remain wary of your messages and will stop them again in a heartbeat if you fail to fix whatever the problem is, says Baird. “You have to be prepared to do the hard work of cleaning your files,” she adds. Of course, the trick is to avoid getting your e-mails blocked to begin with. One way to do this is to not mail consumers likely to complain. And when they do gripe, remove them immediately. Just as in traditional direct marketing, it is crucial that marketers track the sources of e-mail names. If one particular source is causing trouble, it can be addressed, says Baird. These days, most of the major ISPs make so-called feedback loops available to e-mailers so they can track spam complaints. What’s the dollar value on avoiding these? That’s hard to determine. “In the old days you could say, ‘We saved a half a million dollars last year using RFM’ and you could take that to the bank,” says Hughes. With e-mail, “you can’t make a statement like that because nobody knows what an e-mail name is worth,” he adds. However, RFM analysis should be viewed as a way to preserve the viability of the e-mail channel rather than as a way to save money, says Baird. “The cost of ignoring these metrics will be the inability to generate any revenue if, for example, AOL stops you from communicating with all your AOL customers,” says Baird. The idea behind traditional RFM analysis for print is that people who have purchased from a marketer recently are more likely to buy again than those who purchased a long time ago. Hughes then recommends sorting the database similarly by frequency of purchase, giving the top 20% of customers a “five” and the least frequent purchasers a “one.” This is based on the idea that people who buy more frequently tend to respond better to promotions than those who buy less frequently. He also urges mailers to segment people by the amount of money they spend on a regular basis, or since becoming a customer, once again assigning a “five” to big spenders and a “one” to the bottom 20%. This technique results in 125 cells of customers sorted by their recency, frequency and monetary value scores, from 555 all the way down to 111. Those who score all ones are the losers. While people who spend more and buy more frequently tend to be better responders, the most dramatic differences in response rates are found in the recency metric. The most recent buyers are more likely to spring again. 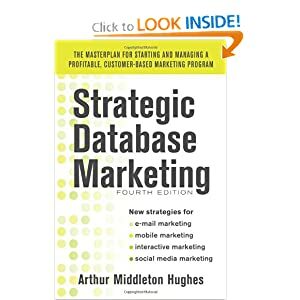 Hughes also points out that RFM is the foundation of any database marketing scheme and highly unlikely to disappear with or without e-mail.